Spring is here at last and we are looking forward to meeting you soon on the EBSN Annual Conference in Ljubljana in June. Please, do not forget to register by 15 May! 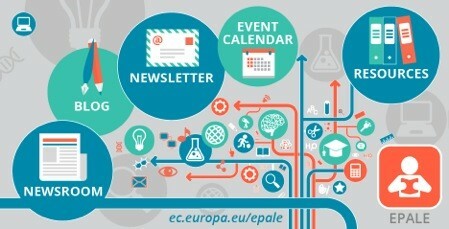 There are some other events in the spring-summer period you might be interested in, so we have collected them together below alongside with some resources, news and blogs from the EPALE portal. Among the upcoming events we would like to call your attention to the Migrant Education Week on EPALE (see below), where the contribution of the EBSN members is highly welcome. The organisers of the Migrant Education Week would like to feature blogs and/or interviews with EBSN members outlining their experiences and would also like to hear from those that you work with in migrant education – teachers, managers, volunteers – and of course migrants themselves. Please write an e-mail to ebsn-epale@basicskills.euif you want to contribute. The EPALE Migrant Education Week will also support the launch of the EBSN SIG: Second Language Acquisition for Migrants. More information will be published soon. This Workshop, organised by the UNESCO Institute for Lifelong Learning (UIL), aims to facilitate the linking of literacy efforts in libraries with national literacy plans, policies and strategies. The specific objectives of the Workshop are: a) to exchange effective and innovative practices in and current research on library efforts to improve community literacy; b) to provide a forum for discussion on how to integrate existing library activities into local, regional and national literacy efforts and advocate for the benefits of linking these efforts; c) to share practical tools (such as specific indicators, benchmarks and corresponding data needs) for measuring and implementing these efforts; d) to learn about the capacity development needs of librarians and government officials for the effective implementation of literacy efforts in libraries to support Education 2030 and SDG 4.6; and e) to collect the content, including policy recommendations, for an international policy brief, which will be a direct outcome of the workshop. “Special needs” and “Learning Disabilities”: two important topics in nowadays schools. Italy and its inclusive schools system is a very innovative way of working in the educational system. This intensive course gives to educational figures the possibility to learn methodologies and tools to understand the way of working with students with these kind of difficulties, in a formal and informal way, having some practical experiences together with the theoretical part. This conference will be held at international level. Every year, EDULEARN brings together more than 700 delegates from 80 different countries. The Foundation for Human Resources Development in Malta is offering a Level 5 Award ‘Train the Trainer’ course. It is aimed at those who frequently need to develop training programme and deliver presentations. Throughout the course participants will be able to learn how to create their own training courses and deliver them in a successful and effective manner. The programme will equip participants with the essential skills and techniques to enable them to identify training needs, plan, design, and deliver training. The deadline for sending the application by email is 30 June 2016. The UK Commission for Employment and Skills (UKCES) recently produced the Employer Skills Survey, the third biennially edition. Over 90,000 establishments across the UK reported their experiences on a wide range of issues including; skills gaps and shortages, investment in training and under-employment. In October 2016 the UNESCO Institute for Lifelong Learning (UIL) will offer six CONFINTEA Fellowships(link is external) for a period of one month to government officials and representatives of civil society organizations working in key positions within the field of adult learning and education (ALE) in UNESCO Member States. The recently launched DIMA project aims to create a practical and innovative toolkit for developing, implementing and monitoring adult education strategies. Through that, adult education providers and local and national authorities will be enabled to actively contribute to adult education policies at the national and European levels and thus to increase adults' participation in education and training. Looking at the latest statistics, it appears urgent to increase adults' participation in education and training, enhance basic skills for disadvantaged groups as well as upskill or re-skill unemployed people, especially young adults. To do so, it is important to understand which kind of mechanisms are in place, to investigate how they are perceived by providers and policy-makers as well as to find efficient ways to adjust them to improve the impact and quality of policies. Dr Suzanne Piscopo is a full-time lecturer and Head of Department for Heath, Physical Education and Consumer Studies within the Faculty of Education at the University of Malta. She has extensive knowledge on initial teacher training, food technology, health nutrition, consumer studies and home economics. In this interview she speaks to Mahira Mifsud about the role of adult education in supporting people living longer and healthier lives. What makes adult learning policies successful? Andrew McCoshan reviews a new report from the European Commission: “An in-depth analysis of adult learning policies and their effectiveness in Europe” by ICF Consulting Services Limited.